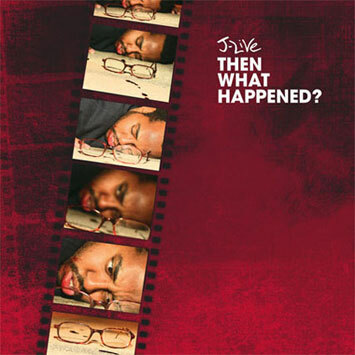 J-Live is set to release his fourth full length Then What Happened May 27th on BBE. The album features production/appearances from DJ Jazzy Jeff, DJ Numark, Chali 2Na, Posdanous of De La Soul, Oddisee, Evil Dee of Da Beatminerz, Marco Polo, Cap D and more. Don't even start this bio yet. Stop reading for a second and listen to track 11, "We Are," off J-Live's new album Then What Happened. It's DJ Spinna manning the boards so you know the beat is crazy. And if the song was only J-Live spitting in his inimitable style, simultaneously gritty and smooth, rough yet fluid, you already got a classic on your hands. But there's something else-something subtler-that comes into play. Listen closely to the first verse, specifically how J-Live tailors his verse to match the vocal samples, word for word, on the beat. That's what separates gifted from great. And that's what the New York emcee has been doing for the better part of a decade. You all remember The Best Part, right? You know, the album with Pete Rock, DJ Premier, Prince Paul & 88 Keys all fighting to contribute? Thanks to a series of unfortunate circumstances too numerous to name here, the album, recorded in '96, didn't see light of day officially until 2001. No matter. By that point, it was already what many still call "the best hip-hop album you've never heard," and what J-Live himself dubs "a talented, undrafted free agent on a really bad team." But that's past tense and now is now. What we have here is Then What Happened, the fifth full-length by J-Live and indisputably his most personal to date. Recorded between summer '06 and December '07, the emcee shunned the studio to record the entire album in his childrens' bedroom in New York's Spanish Harlem. "I basically would put the laptop on the top bunk, take the mattresses off to use as acoustic treatment, and threw a blanket over the bunk bed frame and called that my vocal booth," says the emcee, DJ and producer. It's a testament to the rapper's technical skill that the final product is virtually indistinguishable from a professional studio. But let's get to J-Live's biggest strengths: his creativity, his honesty, and his ability to integrate myriad topics on one album. Having recently separated from his wife (chronicled here on "The Last Word,") and relocated to Atlanta to be closer to his three kids, there's no shortage of personal issues to discuss. "There's a lot of s#!t that I'm dealing with on this record that'll bring tears of joy and tears of sorrow and I'm hoping to reflect that," says the emcee. "I'm separated and I got three kids. I think people will know what that means." But like any J-Live record, this is only one part of a multi-faceted album. Lyrically, the rapper touches on the changing nature of the music industry, his own successes and shortcomings = (going so far as divulging his total album sales), hip-hop music in general and, if you thought he might be getting too soft, some of the cleverest braggadocio rhymes since Big Daddy Kane. Regardless of the topic, though, what fans have come to expect from the rapper is devout honesty. "There's always a conflict with me as a writer in this craft of hip-hop," admits J-Live. "You want to put your best foot forward and express yourself, but at the same time, you have a responsibility as an emcee to run s#!t and be the alpha male. You walk a thin line between that and bearing your soul." For Then What Happened, like The Best Part, the rapper brought in a slew of producers to find the perfect beat to fit the mood of each song, including Jazzy Jeff, Oddisee and Jurassic 5's Numark. "Simmer Down," J-Live's declaration to just relax and not try to be so hard, rides out over a slow, haunting beat inspired, as the title suggests, by the classic Bob Marley track. On the other end, there's "The Upgrade," where J, De La Soul's Posdnous and producer Oddisee spit over a cheery, soulful beat Dilla would be proud of. Hell, J's not even afraid to spit in 6/8 time on "What You Holdin." Whether the beats inspire the song concepts or vice versa, J-Live exercises strict quality control when it comes to beat selection. "I like to pick beats that have a story of their own," he says. "If I wasn't a writer, the beat should allow me to imagine what the song is about." With J's lyrics there's always more than one meaning to a phrase. "My album titles are little snippets from the 120 Lessons that are dear to me that I find are apropos to what's going on in my life," he explains. "Then What Happened comes from a conversation that dealt with the slave trade. Now that we know happened, then what happened? Where are we as a people? What are we trying to do? And for me specifically in my life, you have these last four full-length albums to sit with and recognize my body of work. I have a niche. I have a fanbase. I have a sound. So then what happened?" On "It Don't Stop," J talks about hip-hop music and its progression/regression in recent years. It's a song that speaks to... "the people that say hip-hop is dead," says J. "That hip-hop has nothing left to offer, that people who are still clinging to the ethics of old are purists, that there's a detachment in generations between the Soulja Boys and Big Daddy Kanes of the world. It's not to dis anything new. There's plenty of room for that without trying to shelf and displace the old s#!t. Just because your beats invoke the sounds of the era we grew up listening to doesn't mean it's old school. It just means it's a certain style." Artist today, who were strong 10 years ago, I am afraid to listen to their music - I don't want it to be wack. I am afraid because I know that artist has that potentioal to drop a dud. J-Live is passed that. J-Live has reach a level of premium work that very few artist ever achieve. Right now, looking at Jay-Z, as great of artist he is, we don't want him to release anymore music. We are afraid of that wack album. Every album J-Live release is surperior work - you know that before the album comes out. J-Live on his album just keeps stride with what he has achieved since 2001. I can not place this album above or below any of his previous work execpt for his debute classic, something that all great artist contain. Have no had the album for 24 hours. Have listened to it in it's entirety at work and at home a total of 9 times. It is a auditorial treat. I know that with each listen i get something new. What has had me most excited about this so far is the production. I feel like he is allowing his style to be used in more widespread spectrum of beats now. The lyrics, as usual, speak for themselves (pun intended).